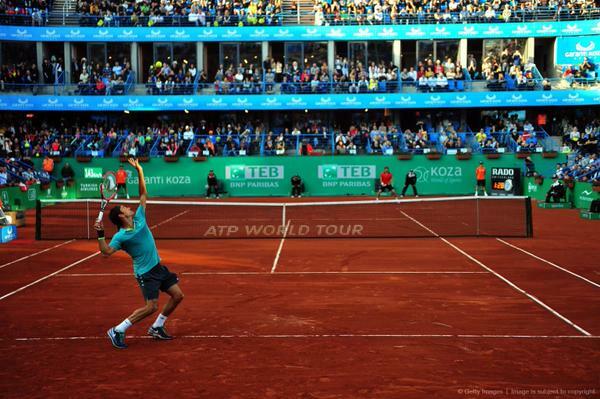 Roger Federer won his 85th career title Sunday in Turkey, winning the inaugural TEB BNP Paribas Istanbul Open. The Swiss maestro defeated Pablo Cuevas 6-3 7-6 (11), who had scored an impressive upset over Grigor Dimitrov in the semifinals. Off to a better start than in his quarterfinal and semifinal matches, the 33-year-old Swiss looked at relative ease, holding at love to start, then breaking Cuevas’ serve to jump out to a 3-0 lead. Without much difficulty on his serve, the Swiss was halfway toward the title. Cuevas then stayed level with Federer on serve, with both players exchanging holds deep into the second set. The Swiss served at 71%, hitting seven aces to two double faults, winning 75% of points on his first serve and 62% of points on his second serve. Despite getting an assumed crucial break, Cuevas would break back to tie up the scoreline and push for a third set. A rollercoaster second set tiebreak ensued, with both players having a few opportune moments. In the end, Federer prevailed 13-11, arms raised in victory. The Istanbul Open title marks his first title on red clay since 2009, when he completed the career grand slam in winning Roland Garros. Federer will head back to Switzerland for a quick stop before flying to Spain for this week’s Mutua Madrid Open (Madrid Masters). He is still undecided on playing the Rome Masters, later this month.